As registered user you can order Magic Sharpener with 10% discount. This option will available within 1 month only. 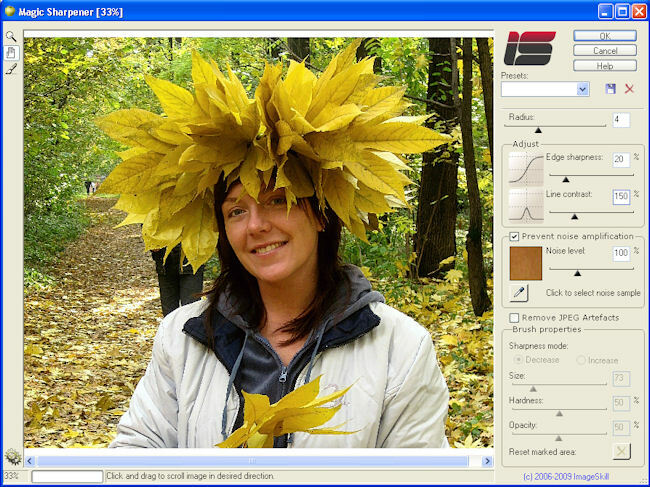 ImageSkill Software announces the release of ImageSkill Magic Sharpener plug-in v.1.5 for Windows. It returns you a feeling of reality and breathes new life into your photo. You will be nicely surprised - your photo becomes more lifelike without serious efforts from your side. You can manage creative process of edges contrast enhancement and sharpness increasing of fine details in a simple intuitive way according to your own manner. Try Magic Sharpener now! It helps you to realize your own flight of fancy. ImageSkill Magic Sharpener is compatible with Adobe Photoshop and Photoshop Elements, Corel (Jasc) Paint Shop Pro, Corel Painter, Corel Photo-Paint and Microsoft Digital Image Suite. ImageSkill Magic Sharpener runs on Microsoft Windows 98/ME/2000/2004/XP/NT3/NT4. The full version of ImageSkill Magic Sharpeneris available in English for $29.95 including VAT. Copyright © 2006 ImageSkill Softtware. All rights reserved.